The structure of the telecommunication sector in Bolivia is different from most other countries. Local service is provided by 16 telephone cooperatives, long distance service by one private company and mobile cellular by two private companies (a third license was issued late last year and expected to start operations in the 4th quarter of 2000). Fixed telephone operators have a monopoly until November 2001 when the market is to be fully opened to competition. The Internet market is experiencing fairly rapid growth but is nonetheless constrained by a number of factors. The most notable are legal restrictions that forbid Internet Service Providers (ISPs) from directly providing their own outgoing international connectivity or domestic leased lines. The ISPs claim that this results in higher costs, poor service and unfair competition from the traditional telecom operators that provide Internet access. Other factors such as low incomes (after Haiti, Bolivia is the second poorest country in the Latin American and Caribbean region), lack of awareness and shortages of and antiquated communication equipment also affect Internet take-up. An ITU team consisting of Michael Minges, Ben Petrazzini and a consultant, Sonia Jorge, visited La Paz from 15 -19 May to carry out research for the Bolivia Internet Case Study. The country's telecom regulator, Superintendencia de Telecomunicaciones (SITTEL), hosted the team. 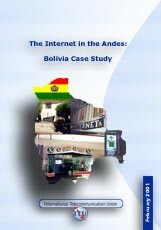 To date, there has been no comprehensive document produced on the state of the Internet in Bolivia. SITTEL is looking forward to the ITU report as it will assist their plans to become more involved in Internet policy issues. The nation makes an interesting addition to the Internet case study series since there are a number of factors that are different from other countries studied. These include a unique telecom structure, dispersed Internet usage (for example there are more Internet users in the tropical city of Santa Cruz than the Andean capital of La Paz), growing Spanish content and a mix of Internet providers ranging from incumbent telecom operators to pan-regional ISPs.